Madar Al-Huruf was created and designed by VCU Qatar graduate, Muneera Al-Badi, for QFI’s Arabic language and Culture program. Al-Badi also developed a user guide and worked closely with US-based teachers of Arabic in Washington, DC, and Tucson, AZ to finalize the wheel’s design. Two Arabic teachers in Tucson, Arizona, Fatima Abdulkazem and Nour Jandali, created a mini unit and student workbook to accompany the wheel for use in the classroom, making the wheel a truly global collaborative endeavor. In the curriculum unit, Fatima and Nour developed the TSCTSC strategy to write one’s name in Arabic for teachers to guide students to write their name in Arabic using the alphabet wheel. This strategy was inspired by and adapted from the book Sugar Comes from Arabic: A Beginner’s Guide to Arabic Letters and Words by Dr. Barbara Whitesides (Interlink Books, 2009). You can download the workbook, here. And download the curriculum unit, here. Due to the success and demand of the physical Arabic wheel, QFI worked with Al-Badi and partnered with Qatar Computing Research Institute (QCRI), a nonprofit multidisciplinary computing research institute founded by the Qatar Foundation, to adapt the design virtually into a mobile application. The mobile app version of Madar Al-Huruf, or the “Wheel of Letters,” has more recently undergone a complete update and redesign responding to user feedback. The app now includes sound to hear the spoken letters so beginners are able to hear and sound out the Arabic alphabet. In addition, the app now allows the user to customize and share their name in Arabic as a digital sticker online through social media. An updated interface now includes an option for both novice and experienced users. The novice user is guided step-by-step as they write their name in Arabic. Experienced users are taken directly to the animated wheel where they can spin and select the Arabic characters that match their English name. The wheel is a valuable language tool that introduces users to the Arabic alphabet no matter their experience level. 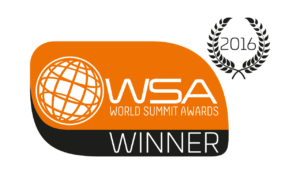 In March of 2017, the app won a World Summit Award within the WSA-mobile category. QFI is proud to say that the Madar Al-Huruf app is among the Top 40 World Summit Award winners! Download the app here from Apple and Google Play stores.